Just on the other side of the window where I sit and sew is a hummingbird feeder. All year round, these graceful little birds entertain me with their lively dance and their energetic zeal for life. Aside from the reminder to take the time to enjoy the moment, these delicate creatures have provided me with plenty of inspiration for my quilting and boutis designs. The inspiration for the image of this hummingbird comes from one of the many photos we have taken watching these birds just on the other side of the glass..
Back in November, when I was working on the star blocks for the baby quilt, (and the star blocks were not cooperating http://seamsfrench.blogspot.ca/2014/11/oh-my-stars.html I pushed them aside for a day or so and started another baby quilt. 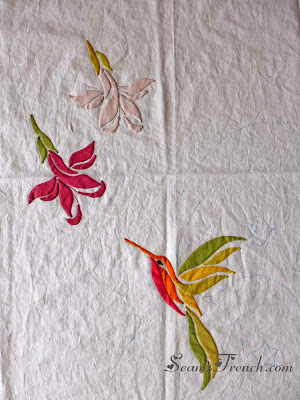 This time, I would pay tribute to these little hummingbirds and make them the focal point of the quilt. As I was stitching away on the star blocks, my attention was often drawn to a neatly wrapped bundle of shot cottons on the side table. I loved the colours, but they were just not right for the star quilt. They would however, be perfect for a simple little hummingbird. And so, with hummingbirds dancing outside the window, and with these beautiful little cottons enticing me, this applique quilt was born. In the wake of the hummingbirds tail feathers is a dusting of hearts and stars. 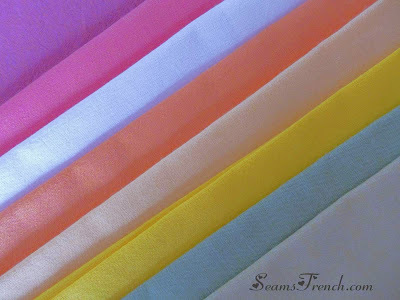 Using this fabric, I have discovered that shot cottons are perfect for hand applique. 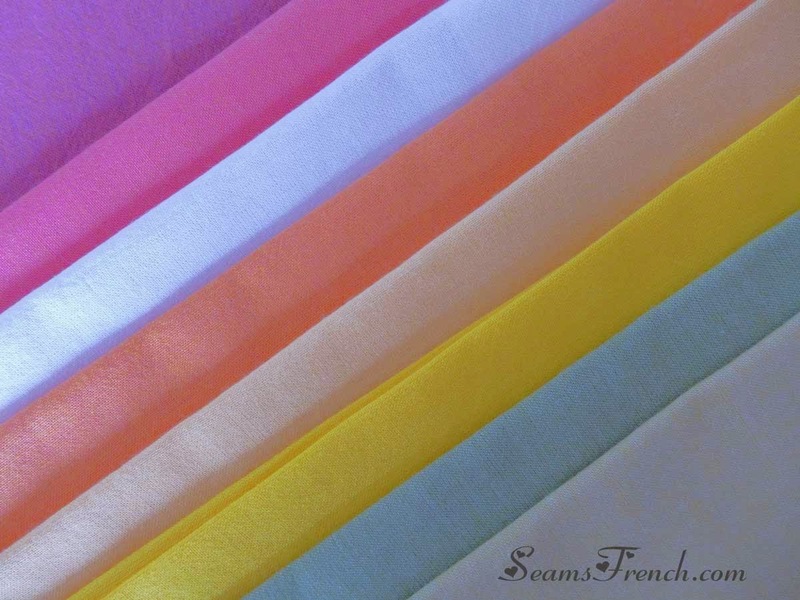 The lightness of the fabric and the pliable weave makes for an easy, smooth needle turn applique. It was hand applique that drew me to quilting in the first place, and this little diversion has reminded me of how much I love hand work. This is the bundle of fat quarters that distracted me from the task at hand. Admittedly, it was a happy distraction. Reluctantly I have to admit that neither quilt was ready for the arrival of our little Miss, but both will be keeping her warm and cozy any day now. 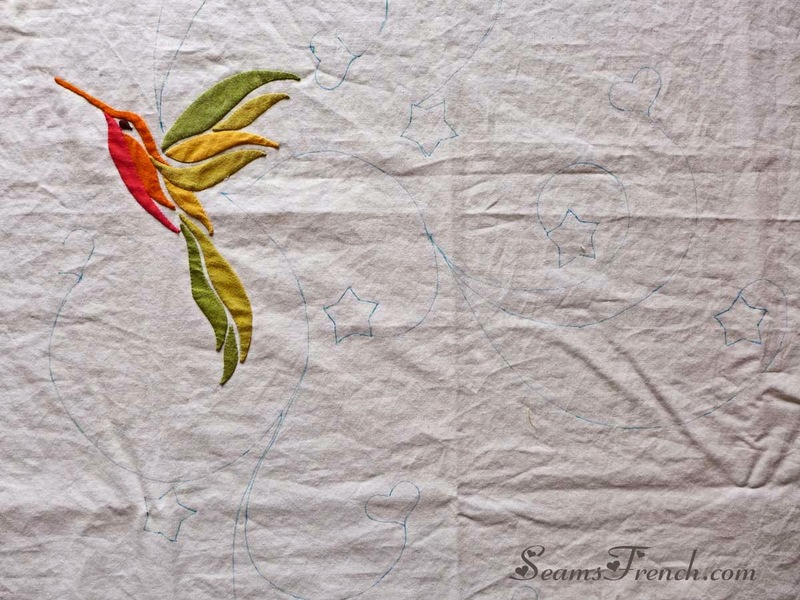 This is such a lovely design, with your beautiful quilting as well it will be amazing. So interesting that you are enjoying your shot cottons. I was just looking at mine today with a sour expression, wondering when the heck I will ever use them! They did not do well in the wash. But they're certainly soft! Anyway, I know *your* quilt will be wonderful! I know what you mean about the durability of shot cottons. I have tried using them for piecing with unsuccessful results. The qualities that I like for applique, (like the softness and easy pliability) make them too weak and loosely woven to use for piecing. I am hoping that the strength and sturdiness of the white base cotton, that the pieces have been stitched onto quite closely, will give them durability. I hope that I don't regret the decision for a quilt that will be washed often.